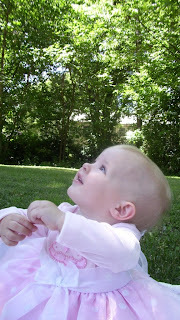 This post was written right after her 1st birthday, I just haven't posted it until now. I am glad I wrote it when I did though, because already, only 3 weeks later she has changed so much! 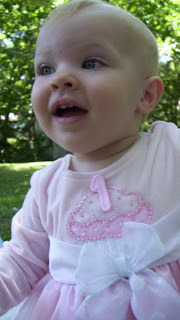 These photos were taken on her actual 1 year birthday (June 30). Awhile back, some friends of ours had a daughter turn one. At that time they wrote a blog entry about all she could do and who she was at one. I really enjoyed that entry and have wanted to do that for Avery. So, as of 1 year, here is a snapshot of who Avery is and what she can do. ~She walks! And really prefers to walk, she still has a ways to go mastering the balance of it all, but she loves the freedom and ability to hold things in her hands while walking. ~She loves people! She is the unofficial greeter at our church on Sunday morning and more than once we have had to take her to the nursery just because she is completely distracting the people in the rows behind us with her flirting. ~She enjoys kids, to a point. We often have kids at our house or go to children's events in the community and she loves interacting with them or watching them. ~She is very very observant. Always has been. She notices every noise and looks to you to explain to her what it is. If something is out of place, she notices it, or points it out to you. ~She is quite independent. She loves books, but more often than not, she wants to look at them and turn the pages by herself. ~She is an on and off eater. The days she doesn't want to eat, nothing will convince her otherwise. The days she wants to eat, she can nearly eat her weight in blueberries, kiwi, green beans, spaghetti, or goldfish crackers. But her favorite thing to eat is whatever is on mommy or daddy's plate. 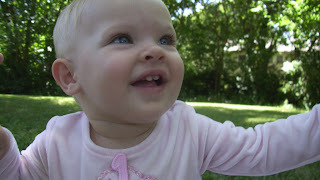 ~She knows how to initiate 'Itsy Bitsy Spider' and can do recognizeable hand motions throughout the song. ~She uses the signs for 'all done', 'more', and 'eat' regularly. ~Her first word was 'dada' and she can now say 'mama', 'bye-bye', and several more that only mommy can understand. She also is imitating a lot of sounds including animal noises. ~She says 'takoo' (thank-you) often and at the proper time. ~She has just learned to stand up without using something to pull up on. ~She loves climbing stairs and has also just learned to go down a step feet first. ~She understands an incredible amount of what is said to her. A scary amount, actually. I can tell her, "Find your puppy so we can go bye-bye" and she will search the house for her favorite stuffed dog and bring him to me. I can also say to her, "Get a diaper and we will change you" and she will get it and bring it to me. I don't even want to guess what all she is absorbing. ~She is an extremely pleasant person. She is very easy going and generally goes along with whatever very well. ~She loves loves her Daddy. When he comes home from work she drops whatever she is doing and makes a beeline for the front door. So, I realize this list could go on and on, but this is a good picture of who Avery is at 1 year. At this point it is going by very fast and I can see the growth and development happening right before my eyes. I am so blessed to have been given this sweet and precious child to 'learn parenting' on. Happy 1 year old my darling girl. Beautiful! Bob bob and Grams miss her and the two of you very much! It is so wonderful to have been there for her 1st birthday and all the progress she has made in just a few weeks! Thank you for sharing this beautiful time in her life.